At dawn the gates of the participated cities were thrown open to allow the exit of the colorfully arrayed Embassy and the athletes. Citizens, remaining at home, followed the procession down dusty roads for several miles and tossed garlands of flowers at the proudly erect athletes and the hopeful members of the Embassy. Days later the travelers arrived at the city of Elis, twenty-four miles north of Olympia. Athletes and their trainers were officially presented to the Olympic officials waiting at Elis. With a formal farewell, the Embassy proceeded to Olympia. By Olympic rules, athletes had to be at Elis for a month or six weeks before the Games started. There the competitors became acclimated to the region; spent grueling days practicing with their own stern trainers and with the trainers assigned by the Olympic Council to be sure that the athletes were at the peak of performance. Officials present made certain that "the deeds they are about to perform are in harmony with the highest moral and artistic level expected of champions." And each athlete was a champion, the best of the city he represented. Close to the banks of the Kladeos River, in the Palaestra and the Gymnasium athletes were privileged to exercise and take final training for the Games. Today one can wander in and out of the ruins of those buildings; and can sit where athletes disrobed oiled and washed themselves; and walk where they practticed. 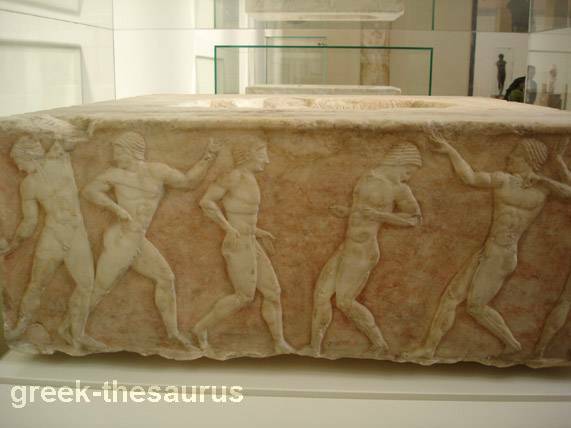 It takes little imagination to invoke the feeling of the Greek athletes as they waited for participation in the events.